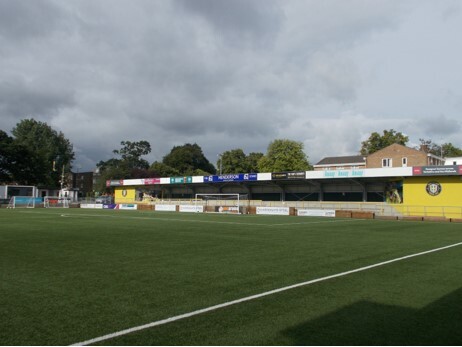 A well earned victory at York Road,Maidenhead,saw Harrogate Town climb to third in the National League table. Town made two changes from Tuesday’s visit to Salford with Ryan Fallowfield replacing the injured Liam Kitching and Joe Leesley returned from suspension to take the place of Jordan Thewlis. The visitors forced a series of early corners and took the lead after eleven minutes. A George Thomson corner was knocked back across goal by Mark Beck for Callum Howe to head in at the near post. Town kept up the pressure and after a penetrative run from Wayne Burrell had opened the home defence,Jack Muldoon saw his low strike hit the upright. Maidenhead, next survived a desperate goalmouth scamble which ended with a Muldoon effort being kicked off the line. Completely against the run of play, Maidenhead got back into the game after twentyfive minutes, when James Belshaw was ruled to have picked up a back pass,much to his indignation. Reece Cole’s indirect free kick was turned in from close range by Clifton,but it took a consultation between the Referee and Assistant before the goal was awarded. Just before the break,Town could have regained the lead when Fallowfield crossed from the right and found Muldoon, whose shot was parried by keeper,Pentney, into the path of Jack Emmett,who skyed his follow up over the bar. Harrogate started the second period on the front foot,with Howe pushing forward to head a Thomson corner inches over the bar,before,moments later, Josh Falkingham blazed just wide of the top corner. The hosts were finding it hard to create chances,although Coles and Ayo Obileye worked hard,and it took an excellent block from Burrell to deny the latter. The Town faithful were pleased to see Dom Knowles return from injury when he came on as a sub together with Michael Woods, as Town sought a deserved winner. Town’s pressure was eventually rewarded with fourteen minutes left,when a Leesley corner found the ever reliable,Kelvin Langmead,who rifled in on the turn. A late drive from Leesley was deflected on to the inside of the upright,but it didn’t matter as the final whistle sounded with Town still in the lead. Unused subs,Owusu,Peters. Scorer Clifton 25.